Green Valley Organics is a company that makes lactose free dairy products. Many people cannot handle lactose but still want to be able to eat dairy products and that is where Green Valley comes in. They make different yogurts, sour creams, and kefir. When I received this package on Friday, I opened up the kefir right away to try. I was sent the blueberry pom acai flavor. 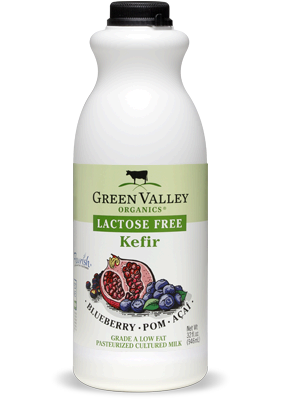 It is the best kefir that I have ever tried! It is slightly tart and full of flavor. Two days later, I already have half of the container drank. The best way that I can describe the texture of kefir to people is a mix between yogurt and milk. It is full of probiotics and live cultures and is very good for you. I would highly recommend this kind to people. Next, my husband and I tried the sour cream on a couple of different meals. We made venison chili and topped it with a dollop of this sour cream. It was amazing! It was super rich and melted right into the chili. You cannot tell the difference between products with or without lactose. Also, I made falafel pitas with onion, cucumbers, spinach, hummus, and a dollop of sour cream. The sour cream gave an excellent creamy flavor. Something to note about this sour cream is that it is higher in calories than many sour creams (100 calories/serving). I am extremely impressed with these products and hope to find them in my local grocery stores soon.